Do you need to launch an outdoor advertising campaign on a really tight budget? Worry not – you can carry out an effective campaign no matter how small your budget is with our cheap yet high-quality block flags. Our block banners will help you get the word out about your products and services without costing you a fortune. They are also convenient and versatile; they will enable you to save some money on your advertising budget in the long run. These block flags for sale are affordable enough to fit even the tightest of advertising budgets. But although they are cheap, it doesn’t mean that their price reflects on their appearance. In fact, it would be hard to tell how much they actually cost just by looking at them. They are simple yet attractive in style, as well as smartly designed. Our block flags are best suited to outdoor advertising, such as sidewalk installations and real estate banners that invite people to attend open houses and view property. 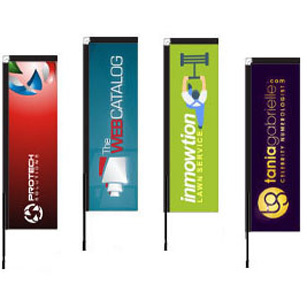 Aside from real estate signs and other outdoor signage, these flags can also be used indoors. They can be placed in front of stores to promote products, services and sales. They are also great for sponsored corporate events where you are required to display the sponsors’ company logos as part of the marketing. 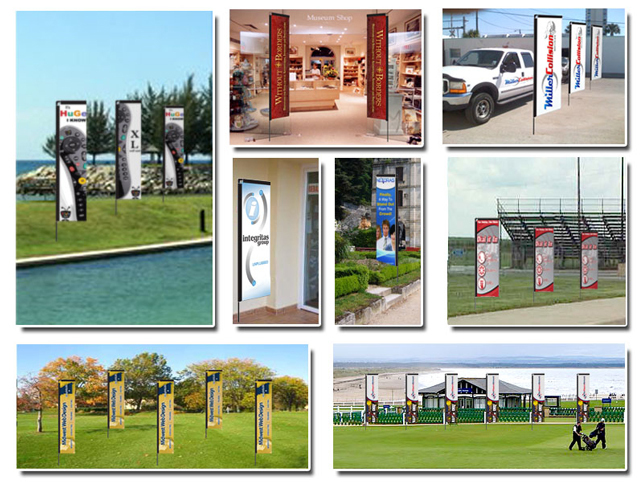 Each of our block banners consist of a fabric graphic, an aluminium pole support, and an aluminium base. The secret of our block banners lies in the quality of our fabric graphic. The graphic is full colour, with accurately rendered details and rich hues. More importantly, it is highly resistant to the elements so its colours and details will not fade easily even when left exposed to sunlight, rain or wind for prolonged periods. You can order it single-sided or double-sided, although it is highly recommended that you get the double-sided graphic to maximise the power of your displays. Perhaps the best advantage you will get out of these banners is that aside from their affordable price, you will get a lot of mileage out of them. As mentioned above, you can use them outdoors and indoors. And because they are resistant against fading, you can use them as often and as long as you want. The aluminium support structure is reusable; if you need new displays, just order new fabric graphics and attach them to your existing support base. Assembling these block banners will only take you five minutes to complete. First, you’ll need to fasten together the tubes making up the support pole of the banner and lock them at the joints. Then, insert this supporting pole through the seam on the side of the fabric graphic and secure it by tying the bungee cord at its bottom. Lastly, insert the bottom end of the pole into the slot allotted in its base. If you’re using these flags outdoors, it means you’ll have to drive a spike through the ground. If you’re using them indoors, just place the crossbar on the floor. If you are looking for cheap signage in Melbourne, Sydney, Adelaide, Perth, Canberra, Brisbane or Gold Coast, we have the block flags for sale you are searching for. 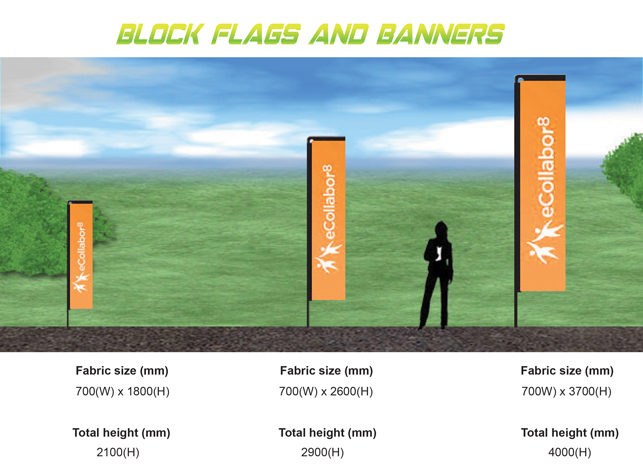 Call us right now to find out more about our block flags and banners.